Please note that measurements are approximate and may be adjusted to better suit the frame of the wearer. Wash the material in water, without soap, to allow for any possible shrinkage. This should be done even if the material is labeled as dry clean only as it does frequently rain at the faire. Air-dry the fabric. The selvage of the fabric will be at the waist and hem of the skirt. Fold the fabric to halve the length and cut the fabric at the fold. directional pattern. Zigzag stitch the raw ends on both pieces of fabric to prevent raveling. Fold and iron ½ inch of fabric along the angled cut. Fold and iron a second time. Stitch this edge. Do this for the other panel as well. Place the two panels together, right side to right side. On the edge that does not slant, sew a seam that runs from the hem (narrower end) to 7” short of the waist. Fold and press open the seam, including the part that was not sewn. Fold and iron ½ inch of fabric along the slit. Fold and iron a second time. Stitch around the slit to create a finished edge. Measure the wearer’s waist with underskirt and hoop skirt on. Subtract 2” from this measurement and then halve it. Each panel of the skirt should be slightly longer than this measurement after pleating. Measure in 4" to 6" at the top of the skirt on the angled sides. This portion of the skirt is to remain flat and marks where the pleating will begin. Pleat the skirt, moving from the front of each panel towards the slit at the back. Pin the pleats twice, at the top and again about 2” lower, to prevent them from slipping during sewing. The best effect will be obtained if the pleats measure consistently on the front and consistently on the back. Pleats should be 1” or smaller. When deciding on the pleat size, consider the resulting fabric thickness and how your machine will react to it. Cut a strip of fabric from the excess length at hem of the skirt that is as long as the waist measurement plus 3”. The strip should be 5” wide for a 2” waistband, 7” for a 3” waistband. Lighter materials work better with smaller waistbands. Zigzag stitch all raw edges. the end seam. Lay the waistband, right side to right side, along the pleated edge of the skirt. Pin the first panel towards the angled edge, being careful not to disturb the pleats. Leave a 2” gap between the angled edges of the 2 panels. Continue pinning the second panel toward the slit. Sides. Sewing this side of the waistband on may be easier to do by hand due to the thickness of the pleated skirt. 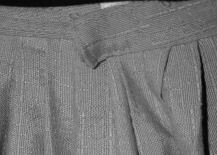 Tuck in ½” at ends of the waistband and sew closed to create a finished edge. Stitch a 6" piece of the soft side of the Velcro to the inside of the end of the waistband that is slightly longer than the skirt. The Velcro should be facing towards the wearer. Stitch a 1½" piece of the hook side of the Velcro to the flush end of the waistband. This Velcro should face away from the wearer. All Velcro should be attached so that it is not visible when the skirt is being worn. The overskirt should be hemmed while wearing a hoop skirt and underskirt. Turn the edge under at the desired length and pin. It is acceptable to have the back of the skirt trail a bit on the ground if this effect is desired. Cut off any excess material and zigzag stitch the raw end. Stitch the hem by hand. Iron the pleats at the waistband and a few inches lower so that they lay flat.